Featuring expert critiques from Las Vegas’ top three food writers, the ever-feisty trio never fails to amuse, as well as inform, with their unorthodox approach to restaurant reviewing. With Forewords by John Mariani (Esquire), Robin Leach (“Lifestyles of the Rich & Famous”; Vegas DeLuxe), and Alan Richman (GQ), the three volumes feature beautiful full-color photography, plus a back-of-the-book section of “Additional Recommendations,” – from pizza to sushi, cheap eats to Chinatown, and steakhouses to desserts – which expanded with each new edition and provides an alternate wallet-friendly take on dining, lunching, or even breakfasting out in Sin City. 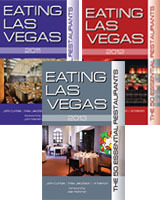 While nothing stays still for long in Las Vegas, and some restaurants featured over the years are no longer with us, these unique volumes remain a must-have guide to eating in what’s now recognized as one of America’s top culinary destinations, and with only limited numbers remaining of each edition, these are set to become a collector’s item that no foodie or Vegas fan should be without on their bookshelf.